Ally and Jackson, together again! Lady Gaga and Bradley Cooper in the Oscar-nominated film "A Star Is Born. "Warner Bros.
Jackson and Ally, together again! 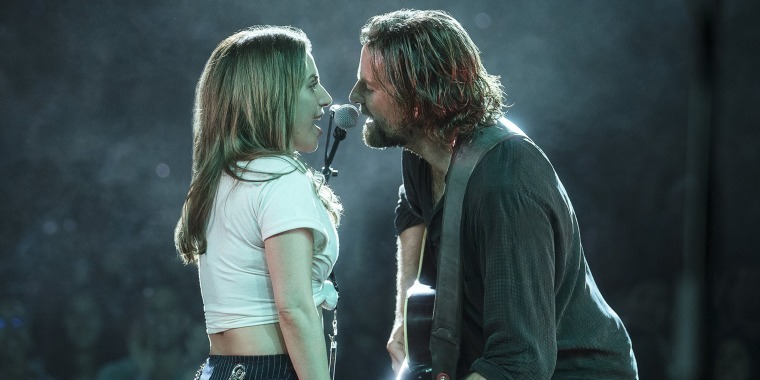 OK, that's a headline "A Star is Born" fans know is never going to happen, but on Saturday night we got as close as possible when the film's Oscar-nominated co-stars Bradley Cooper and Lady Gaga came together again onstage to duet on the movie's signature tune "Shallow," which is also nominated for an Oscar. Gaga is in the middle of her "Enigma" concert residency in Las Vegas, and invited Cooper (who also directed the film) on stage for the all-important duet their characters sing in the film. "Jackson never used these," Cooper quipped to the crowd. The pair were clearly in sync; Gaga gave him a peck on the cheek as they took turns at the piano, looking at each other fondly as the song progressed. At the end, Cooper sat next to Gaga and put his arm around her waist. With that kind of a performance, we're swooning all over again!